The Post-Birthday World begins with a moment - a moment in which Irina McGovern must decide whether to kiss her enigmatic and unpredictable friend, top-ranked snooker player Ramsey Acton, or return home to her partner of ten years, loyal and steadfast Lawrence Trainer. Chapter One ends at that pivotal moment, and then the book breaks off, traveling through two alternate realities - one in which she goes through with the kiss, and one in which she doesn't. From that point on, we get two chapter two's, two chapter three's, etc, which mirror one another in clever and surprising ways, showing how differently - and not-so-differently - Irina's life turns out, based on that one choice. I don't think there's a person alive who hasn't wondered "what if? ", who hasn't imagined how their life would be if they had done something differently. In this book, we get the chance to see such daydreams through. Nearly every review I've read of this book compares it to the Gwyneth Paltrow movie Sliding Doors, which follows a similar conceit. While it's tempting to do the same, I will not. First of all, I don't really remember the movie. Second and more importantly, this book is less about the gimmick, and more about the extraordinary writing and nuances of emotion that Lionel Shriver captures. There are so many things I want to point out about this book that it seems easiest to do it in list form. Interiority of Character - If you are wondering how to give characters a rich inner life, then Shriver is the writer you should be reading. While knowing every passing thought that passes through Irina's mind, and reading as she struggles with her emotions and feelings for pages at a time can be occasionally tedious, it's worth it. Seeing so many sides of Irina, understanding her so intimately, made me go from kind of despising her in the beginning, to seeing her as a true heroine by the end. Complexities of Relationships - This book masterfully captures how complex our relationships are. Better yet, because of the structure of the book, we get to experience both the comfortable monotony of a long-standing partnership, as well as the lusty excitement and stress of a passionate, brand new relationship. Shriver paints both versions of love as having good sides and bad sides, and deftly shows how no relationship - old or new - is ever easy or simple or any kind of guarantee. Sometimes Gimmicks Work - I'll admit, at first I rolled my eyes at the structure of the story. Really? I thought. She's just going to tell the same story twice, in two different ways? But after the first three or so chapters, I was hooked. I was dying to know what would happen next, what consequences Irina would suffer, which decision would end up being the "right" one - a tricky desire, as Shriver shows us again and again that life is so much more complicated than simple right and wrong. By the end of the book - which was so perfect, and so satisfying, and exactly what I had hoped for - I was completely sold on the structure and couldn't imagine telling this story any other way. Flat Characters, Predictable Outcomes - While Irina is complicated and has a rich inner life and experiences incredible growth and change over the course of the book, the same cannot be said for the other two characters - Ramsey and Lawrence. They're such complete opposites that at times they seem more like foils than actual people. Also, while the Ramsey storyline had a lot of twists and surprises, I found the Lawrence storyline to be fairly predictable. I was, however, still emotionally effected when things finally panned out as I thought they would. Just because you think something is going to happen doesn't necessarily mean you are disappointed when you're proven right. Damn Good Writing - Lionel Shriver is one talented writer, and I cannot wait to read her other book, We Need to Talk About Kevin. 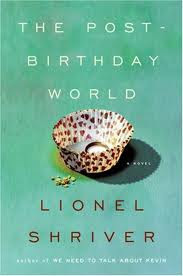 I had originally planned to read that one this summer, but then found out it was on the reading list for a class I'm taking in the fall, so I decided to go with The Post-Birthday World instead. I'm glad I did. From what I hear, We Need to Talk About Kevin is difficult and intense, so I think The Post-Birthday World was a better fit for summer reading - beautifully written, engaging,and clever. Ultimately, it's a satisfying exploration of the complexities of relationships, how we view the people we love, how we understand ourselves, and how the smallest moments can change the course of our every day lives.